Finally, the “New Year” has arrived, and here I am wishing every blogger and reader “A VERY HAPPY AND PROSPEROUS NEW YEAR”. Me and my husband are lazy people and we love to spend time together in peaceful surroundings. And as expected from us, we stayed home on the new year eve and watched a movie, partied together and had a peaceful celebration listening to the bursting crackers and cheerful wishes from outside. 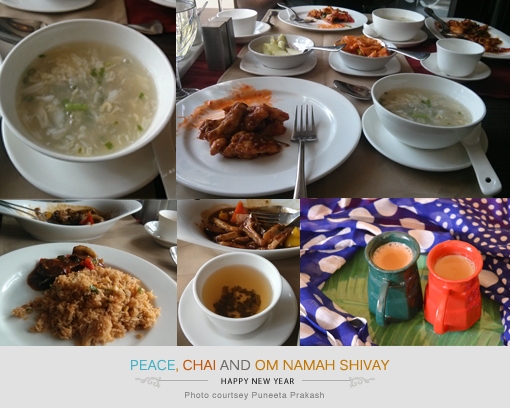 Our new year has started on a lazy note with steaming cups of chai followed by a visit to the Shiva temple and a hearty lunch. On new year eve, people generally look back, evaluating the past days and making fresh resolutions for the coming year. But, I will do none of that. I don’t take stock and no longer make resolutions at the start of a new year. Honestly, who keeps their resolution say after a week, month or two months?? And, I am certainly not one of those headstrong ladies’ who would stick to her so called resolution made in a hassle on new year eve!! So, all I do is just enjoy the leave I get on 1st January 🙂 Simple as that!! As I grow in age, I have realized that I can’t bound my life by the beginning and ending of a single year. The end and beginning of each year merely spill into each other. As months, days and hours, march in to fill the empty year ahead, I know that some days will follow the same pattern as in the past years, some a little worse, many a little better and only a few with a streak of rebel in them. Those are the ones that will be different!! And for both you and me I wish that those days bloom into something good to remember them by 🙂 I wish that 2014 brings lots of happiness, success, new challenges, good health and sound sleep in our lives.